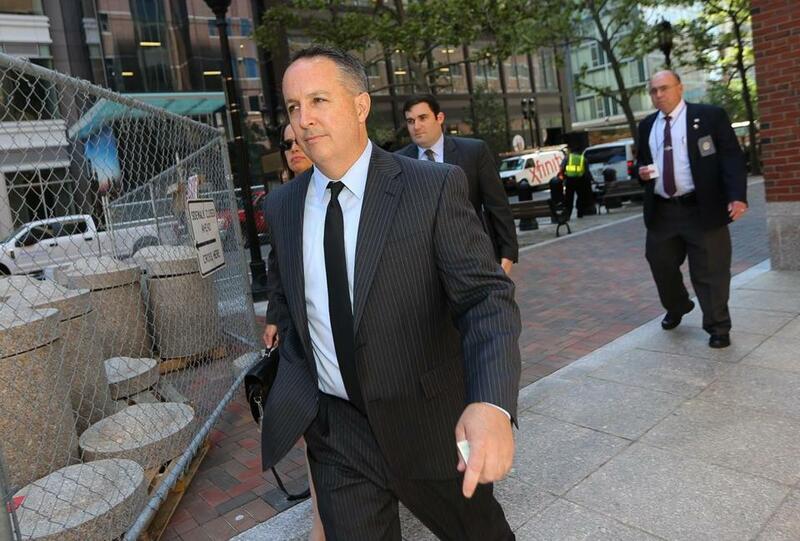 Barry Cadden, who received a 9-year prison sentence, co-owned New England Compounding Center. Above: Cadden made his way into court Monday. The former co-owner of the Framingham compounding pharmacy blamed for scores of deaths and hundreds of meningitis infections in 2012 was sentenced Monday to 9 years in prison. The sentencing of Barry J. Cadden in US District Court in Boston followed stark, emotional testimony by people who fell ill or lost loved ones due to contaminated medicines sent out by Cadden’s company, New England Compounding Center. “I am so sorry for your extraordinary loss,” Cadden told the victims, in a slow, halting statement, during which he paused repeatedly to collect himself. He said he would forever carry the burden of what his company had done. “The reality haunts me now and will for the rest of my life,” he told the packed courtroom, which, according to prosecutors, included 28 people who were injured or lost a family member to the tainted drugs. Cadden was convicted in March of fraud and racketeering charges stemming from the public health crisis triggered when NECC sent tainted medicines around the country, causing a fungal meningitis outbreak that killed at least 60 and sickened hundreds. The jury did not convict him of second-degree murder charges. US District Judge Richard Stearns said before he handed down his sentence that he had read more than 600 pages of victim statements. About 20 victims offered in-person statements before the judge imposed the sentence late Monday afternoon. Each of the statements was powerful, with many invoking images of loved ones suffering with agonizing pain. One survivor said the pain was so bad she prayed for death and had considered suicide. A widow spoke about the empty space on the other side of the bed. Rachelle Shuff, of Indiana, walked slowly to the podium with a cane, then delivered a lengthy and gut-wrenching statement, which began with a description of the auto accident that changed her life. Her doctor prescribed steroid shots to aid her recovery, and she became infected by the tainted drugs. “My days are just full of stress and pain,” she said, near tears. While she was hospitalized, “My priest came and gave me last rites, and my kids said goodbye to me,” she recalled. She once even told her husband that he ought to leave her, but he refused. “I was just ready to give up,” she said. “I will die from this,” Shuff said, starkly. She said she hopes to live two more years. Robin Hannabass, a victim of the meningitis outbreak, spoke after Cadden’s sentencing. Cadden was mostly stoic during the victim statements. At times he watched the speakers, at other times he stared straight ahead or down at the table. Occasionally he would clench his fist or rub his fingers together. Many of the victims asked the judge to give Cadden the maximum sentence. Prosecutors had asked the judge to sentence Cadden to 35 years in federal prison. Cadden’s defense attorneys had acknowledged that Cadden was not blameless but pointed out that he was not convicted of the most serious charges he had faced, second-degree murder. The defense had recommended a sentence of three years. The judge said neither side properly interpreted federal sentencing guidelines, which, by his calculations, called for a sentence between 87 and 108 months (a little more than 7 years to 9 years). He imposed a sentence at the top of the guidelines, 108 months. Prosecutors wanted Cadden to begin serving his sentence immediately, but Stearns told Cadden to be ready to report to federal prison on Aug. 7. The judge has not yet set a date to determine restitution in the case, according to the US Attorneys office. Mark Arsenault can be reached at mark.arsenault@globe.com. Follow him on Twitter @bostonglobemark. John R. Ellement can be reached at ellement@globe.com. Follow him on Twitter @JREbosglobe.